Instagram is full of photos of sushi burritos. If you’re a fan of sushi, I’m sure by now you’ve seen quite a number of photos of sushi burrito on Instagram. I’m also quite certain that you’ve considered trying to make some at home. Before making the sushi burrito, I’ve probably made sushi about twice, I’m no expert on sushi making, to be honest. But in my opinion, I do think that the main thing about sushi is the getting the rice done properly. There are gazillions of rice out there, but what it needs is the short grained rice – the groceries have made easier by labelling it “sushi rice”. I usually prepare my sushi rice in a rice cooker – never fails! There are a number of steps you need to follow to make proper sushi rice. 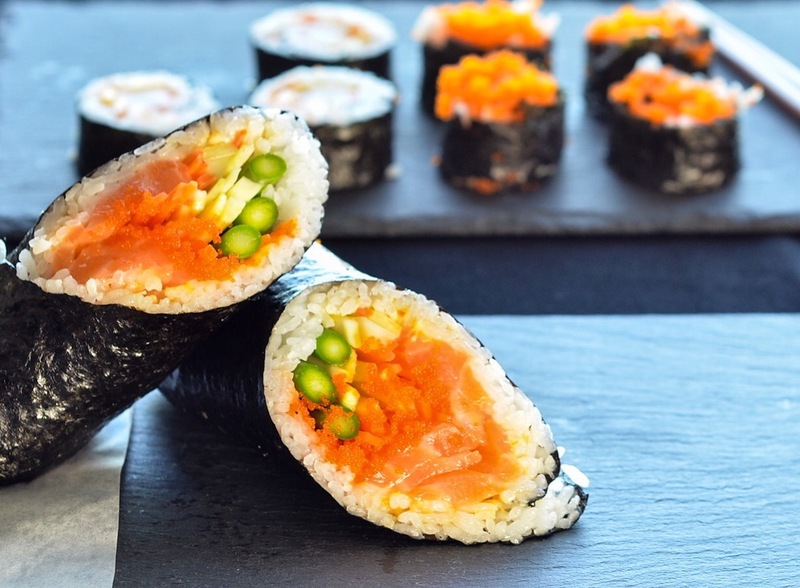 A good website for sushi rice guides is Make My Sushi, which has detailed and easy to follow instructions on how to make sushi rice. The site also covers just about everything you’ll need for making sushi. What’s in my sushi burrito? Sushi burrito is basically an overstuffed sushi hand roll. Try not to overdo the rice though, because you’d like to have a good balance of the good stuff. I included raw salmon, blanched asparagus, masago roe, julienned cucumber, a dab of spicy mayo and toasted sesame. If you’re not a fan of raw sushi, you can use seared tuna, possibly for an alternative. Another option would be spicy tuna from a can. Take a can of tuna and mix 4-5 tbsp spicy mayo (sriracha + mayo), add toasted sesame. Simple spicy tuna. Just a friendly reminder, if you’re using raw fish for your sushi, make sure that it is sushi grade. If you live in North York, Ontario area you can find sushi grade salmon at Taro’s Fish Market. For now, I’ll just leave this photo right here.